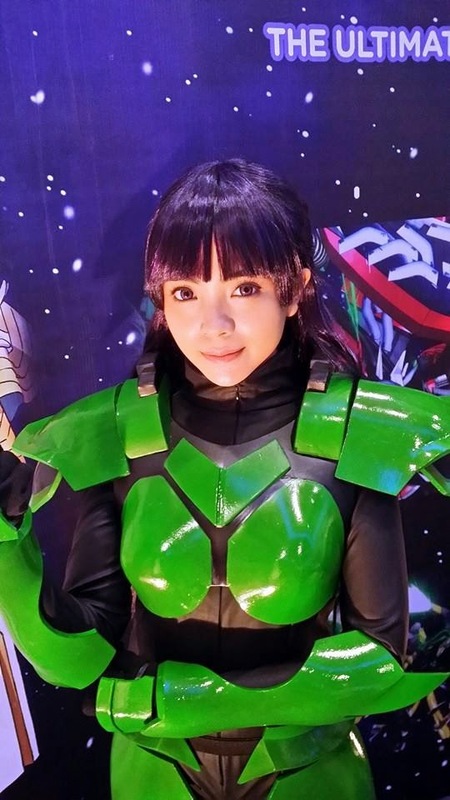 Photo from Anime Pilipinas LIVE @AniPinasLive on Twitter. Cosplay Mania 2014 Evolution just concluded last weekend and I had a blast! I cosplayed, went around the halls and I was also able to say hello to some of my friends. 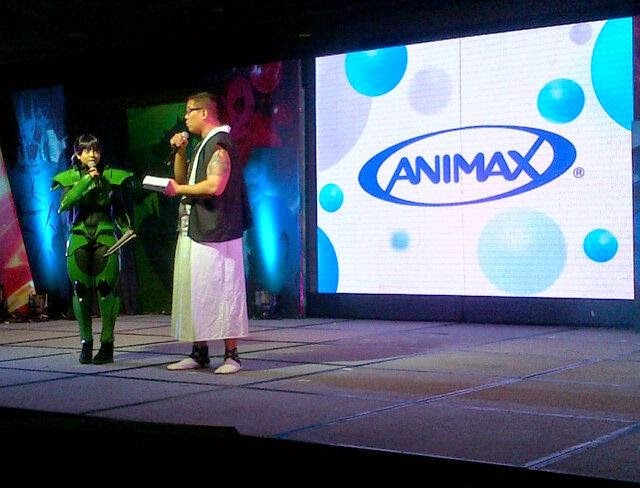 For Day 1, I cosplayed as Azusa Nakano and was on stage to present for Animax. 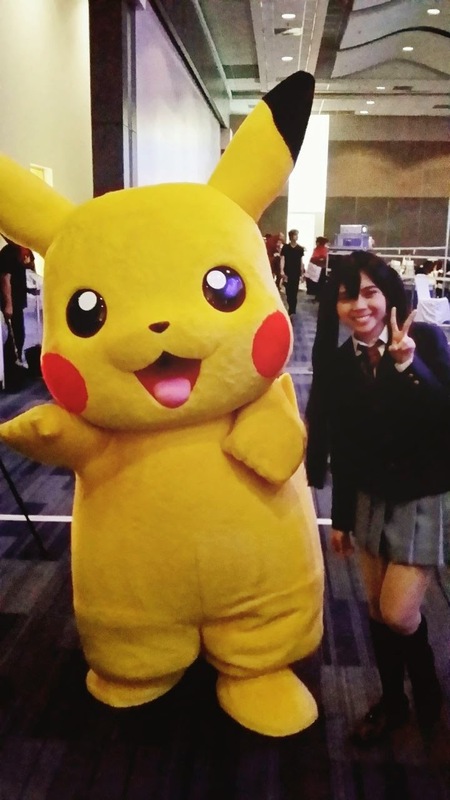 Backstage, I was able to catch up with Melo, who also accompanied me on stage for the segment, and while I was waiting for my turn on stage, a wild Pikachu appeared! The image is a bit blurred since I had to lighten the image and it was dark backstage. Anyway, it was so cute but the whole mascot looked so heavy! I feel for the person who was inside...You made a lot of people happy! Both ears can also twitch so it really looked alive! Now imagine if we were in Yokohama and tons of Pikachu are walking around...Kawaii overload! After my stage time, I went to the Animax booth, took a few photos with those who were at the booth and then went straight to the washroom outside the halls to change to normal mode! For the rest of Day 1, I went around the 3 halls and bought an Itsuka Kotori AR (Augmented Reality) Card from Micari's Anime Shoppe. Come Day 2, clad in my Saki Rukino costume, I went on stage with Melo as my co-host (Thanks a bunch again Melo!) 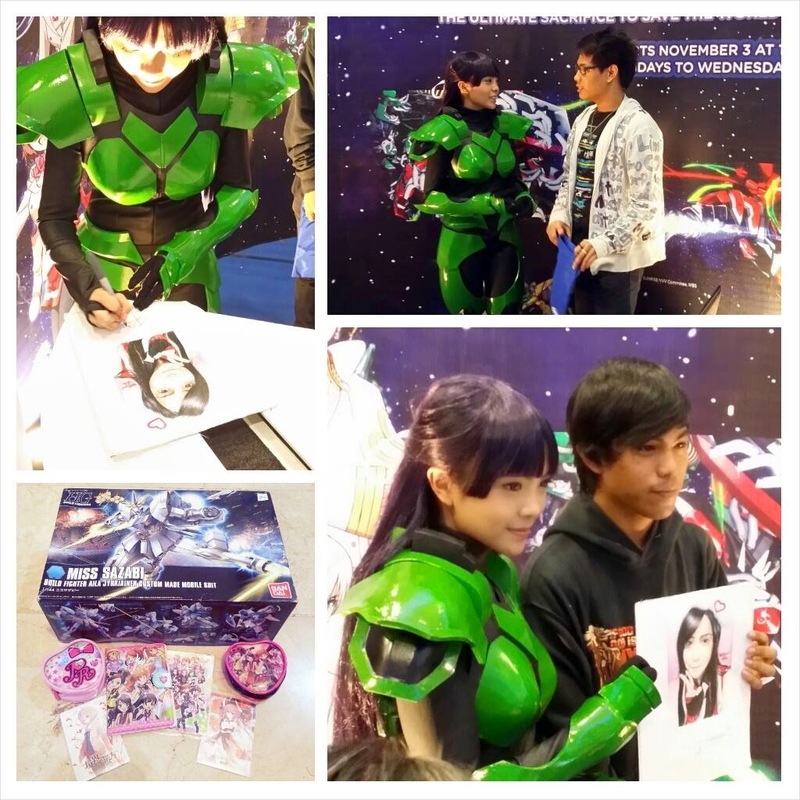 and presented for Animax and gave away prizes! Afterwards, I went to the Animax Philippines booth for the meet & greet. Thanks to those who went to the meet & greet and had their bags, cards and even phone *gasp* signed! Also, I finally got to see the actual artwork of Koala's March that I shared on my page before. Also, big thanks to Wilbert for the Miss Sazabi Kit and Pretty Rhythm Dear My Future Purses, Notepad and Sticker. I'll still have to get the appropriate pens for Miss Sazabi's color but I'll build this soon and complete my Aila cosplay! I actually went out of my costume then went around the hall for a little bit and bought a Mirai Kuriyama AR card from the same shop I got my Itsuka Kotori AR Card. They're just too awesome to resist! Again, thanks to everyone! See you guys in the next events! Special thanks to Lenorf Corpus of RED Factor and Eye Candy Shop!